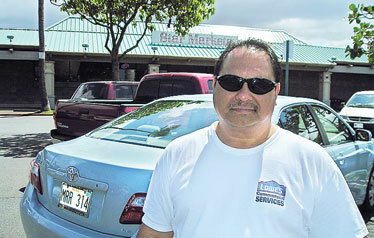 Maui resident Clinton Rebo Sr. said he was sad to see Star Markets in Kahului close. WAILUKU » The Star Market store in Kahului is closing effective March 15 after 36 years in the Maui Mall. Whole Foods Market, a Texas-based health food store chain, is planning to occupy the space. Some Star Market employees are being transferred to the store's other locations in south and west Maui. When the retailer opened at the Maui Mall in Kahului in March 1971, there were a few grocery stores in central Maui. But the mix of competition has changed. Safeway is now located across the street from Star's Kahului store, and Costco is a half mile away. Also, more people are shopping at natural-foods stores, including Down To Earth Natural Foods in Makawao and Kahului and Mana Foods in Paia. Some residents say they'll miss the Star Market employees who work in Kahului and the fresh produce and the cuts of meat and fish. "It's sad to see the store closing," said Clinton Rebo Sr., who has been shopping there since it opened. "It was really a fixture on the island." Richard Cua said the proximity of Star Market to his home made shopping convenient. But Cua, 85, said his wife will be happy to see a new health food store opening in its place. "She shops at the health food stores all the time," he said. The store announced its products will be sold at 25 percent off until closing, except for coffee and newspapers. Star Market closed its store in Kaneohe on Feb. 18 and in Kahala on March 11 but still has stores at Kamehameha Shopping Center, Mililani Town Center and Ewa Beach Shopping Center, along with two on Maui and one on Kauai. Whole Foods Market, selling mainly natural and organic food with more than 200 stores in the United States, Canada and the United Kingdom, is scheduled to open its first store in Hawaii at the Kahala Mall in September, followed by other Oahu locations, including one in Ward Village Shops. » Graunke back for spring drills?